• Constructed with a combination of perforated and non-perforated top grade drum dyed leather (1.2-1.4mm). • Triple and double-stitched with high strength bonded nylon thread. • Accordion-style expansion panels at knees and waist for increased flexibility and a performance fit. • Heavy duty, 600 denier stretch nylon panels in the inseam and calves for ease of movement. 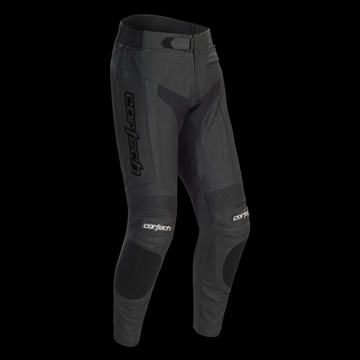 • Pre-Curved knees for comfort and performance in the riding position. • Mesh lining throughout enhances air circulation and comfort. • Features a full-circumference and 8-inch pant to jacket attachment zipper with the jacket sides included. • Elastic waist helps to fine tune the fit. • Pairs with Cortech Adrenaline and Latigo 2.0 jackets.